(CBS/AP) COLORADO SPRINGS, Colo. - A wildfire near Colorado Springs erupted and grew out of control to more than 3 square miles over the weekend, prompting the evacuation of a popular vacation town and the closure of nearby highways Sunday. Officials didn't immediately have a count on those evacuated from campgrounds, inns, rental cabins and other vacation properties that were emptied, but an evacuation center set up at a high school housed mostly tourists. "We were sleeping for 15 minutes when they started knocking on the door  a day from hell," Stein said of the day of travel. With his wife and 12-year-old son, Stein spent the first night of his vacation setting up cots for more than 100 evacuees who slept at the school. 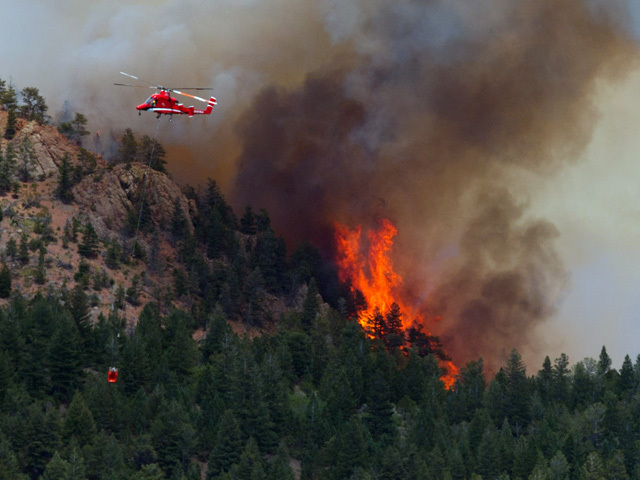 The fire also prompted evacuations for the west side of Colorado Springs and in the towns of Cascade and Ute Pass, but no structures have been destroyed and no buildings were under immediate threat. Colo. temps down, firefighters get "aggressive"
The Garden of the Gods park, which has dramatic red rock formations, was also closed. Pikes Peak, which inspired the song "America the Beautiful" and is the most-visited high-altitude peak in the nation, was completely obscured by grayish smoke. Officials closed traffic into Manitou Springs, a vacation town at the base of Pikes Peak, and shut down the Pikes Peak Highway, which goes to the top of the mountain. Hundreds of other residents were under voluntary evacuation orders and were packing up, the Colorado Springs Gazette reported Saturday. About 350 firefighters were dispatched to the blaze, with more in the way, said Rob Deyerberg of the Fairmount Fire Protection District. But the fire remained zero percent contained as it burned through the night. A plume of smoke from the foothills near Pikes Peak thickened and turned from light gray to brown. Crews were expected to contend with similarly hot and gusty weather on Sunday. The National Weather Service said temperatures were forecast to be close to 100 degrees throughout much of the state. Colorado and other parts of the Southwest have become a tinderbox for wildfires as the region faces extremely dry or prolonged drought conditions. At least seven were burning across the state, where officials have been challenged by one of the most severe fire seasons in recent memory. The weather also helped fuel another blaze that sparked Saturday and destroyed 21 structures near the mountain community of Estes Park. Investigators were determining whether it started in a cabin or as a wildfire before moving toward the homes, according to the Denver Post. "Even though we lost 21 (structures), which is a huge tragedy, we saved many homes because of firefighters' efforts," Estes Park Fire Chief Scott Dorman told evacuees. A separate fire continued burning near Fort Collins, scorching more than 118 square miles and destroying at least 191 homes. That blaze has become the largest and most expensive in Colorado history. While the fire was burning roughly eight miles from the communities of Lynndyl and Leamington and was 60 percent contained, it posed no threat to them at this time, he said. A wildfire that broke out about 60 miles north of Los Angeles has triggered evacuations of campgrounds around an off-road recreation area. The Ventura County Fire Department says the fire was reported shortly after noon Saturday near the Hungry Valley State Vehicular Recreation Area. It has burned at least 400 acres. The cause of the fire is under investigation. Hungry Valley is located along the Interstate 5 corridor, in Gorman. A lightning-caused wildfire that destroyed 242 homes and businesses is 90 percent contained after crews got a break in the weather. Heavy rain Friday helped crews increase containment lines on the 69-square-mile fire near Ruidoso that began June 4. Meanwhile, the more than 464-square-mile Whitewater-Baldy blaze, the largest in state history, is 87 percent contained. It began May 16 as two lightning-caused blazes that merged to form one fire.